Tim Powers has an intriguing idea. As the blurb on the back of this novella says, "What do you do if the man you've vowed to kill dies before you kill him?" Combine that with his novel’s title and the essence of its plot becomes clear. The author quickly sets up his premise, introducing the the protagonist Holbrook and his bitterness at discovering that his nemesis "died happy" (p. 13) amidst a precise description of Holbrook's visit to a morgue. Holbrook has to see for himself that his erstwhile quarry, Atwater, is actually dead. The early scenes of the story continue this approach of advancing multiple lines simultaneously. Holbrook reminisces on the end of his college days, the group of friends which included Atwater, and, almost inevitably, a woman who is the reason for Holbrook's quest: Shasta married Atwater. We soon learn Atwater killed her but "was acquitted after a lot of inadmissible evidence and two hung juries" (p. 20). Now he's dead—and Holbrook still wants satisfaction. His quest leads him to a medium, Martinez, and there is a lovely bit of mummery as Martinez promises to "Advise. Guide. Expedite, possibly" (p. 24). He uses a laptop to speak to the dead—this is the twenty-first century—and text-to-speech software to ensure there is a physical manifestation. Holbrook rushes onwards—the pacing here reflects the protagonist's mental processes beautifully—and it seems as if he is learning a lot that he will need to know on the other side. He is very soon dead, dispensed to Purgatory, and soon realises his very real ignorance. Here the pace has to slow a little. Holbrook has to learn a new world and Powers needs to explain enough of it that the reader can keep up. Holbrook does random things—are they dumb things? At this point we don't have enough context to guess, but Powers enjoys the opportunity of puns and of the protagonist's confusion to make the reader do some work. Still, this is a pretty simple purgatory, a large city which reflects the lives of its current occupants, who seem able to manifest the things most important to them when they were alive. Or perhaps it manifests the things which trapped them in their lives. They can only progress out of purgatory by going "down and out" to the edge of purgatory, nicely generating a pun in the title of the story besides the allusion to George Orwell's Down and Out in Paris and London (1933). In fact, I felt an intense desire to see more references and in-jokes in the material. Maybe I am inventing them myself, reading into the text my own expectation of the author being clever. When a character spends his time in purgatory washing dishes it looks like an echo of the Orwell book, which has its protagonist washing dishes in Paris. When I see a group of tourists trotting after "one of their number who carried a small flag" (p. 106), I read a tip of the hat to Dante's Inferno: in Dante's "ante-Inferno" there are those who chase a blank banner as punishment for choosing neither good nor evil; that ante-inferno could match this purgatory. This is a modestly modern purgatory, however, where the occupants can communicate with our world through mobile phones or radios. There is a scientific sensibility to the nature of the purgatory too, as the sense of descent comes from centrifugal force increasing further away from the arrival point—from the centre of a spinning disk to the outermost edge. Off that edge are the further reaches of the afterlife. In the same way that humanity has many stories of what happens to our souls after we die, the people at this later stage have similar overlapping, conflicting beliefs in what comes next, though many of them, like many of us, expect to be measured "when you fly off the bottom edge of the bell and find out what grade you're in" (p. 58). 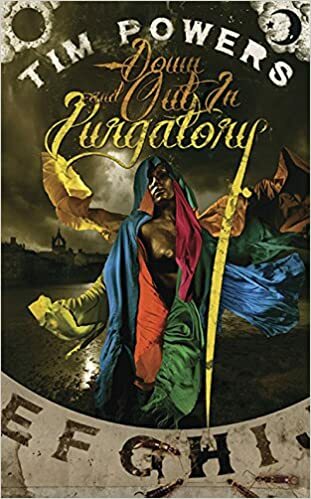 Which, indeed, matches one intent of purgatory in Western culture: as Martinez makes clear early on, the afterlife you go to is a consensual reality and the spirits of Western cultures appear to have a somewhat common view of its nature and purpose. Holbrook eventually catches up with Atwater and is unable to immediately exact his revenge, but discovers that Shasta is still there in purgatory and so (re-)discovers another purpose, of regaining her, bringing shades of Orpheus and Eurydice to the tale. He learns the method of his death would enable him to go back to the world and decides to convince her to come along too. When he does catch up with her, the futility of his life becomes clear, at least to the reader. Shasta, like most occupants of purgatory, has misplaced a lot of the context of her life, but even with her limited recollection she can point out a key fact to Holbrook. "[T]here's something you should know about me." Holbrook has spent his adult life in a purgatory of his own making because he could not get past his obsession with the love of his life, with his failure to create another future for himself. And that has led him, eventually, into this purgatory. Shasta still does not wish to be rescued by Holbrook. He still can't make her into the thing he wants. There is an unexpected resonance here with the last piece I reviewed for Strange Horizons. The protagonist of Googolplex (2015) chooses to spend eternity in a quest for the perfect version of the woman he believes he loves. But Holbrook has more than that: his quest for revenge. Perhaps, again, I am reading too much into the text at the end. Holbrook chooses not to destroy Atwater, instead telling him to "Work out your own damnation in fear and trembling" (p. 114). This is an apposite inversion of a text of St Paul's letter to the Philippians, where the original has salvation rather than damnation; so far so amusing. But it could also be taken as a reference to Kierkegaard's Fear and Trembling (1843). It is not too great a leap of the imagination to consider Holbrook's action as a revocation of the personal, instead allowing Atwater to be measured against the ethics of the universal. Unfortunately, my enjoyment of this novella was quite heavily dependent on my own imaginative leaps, reading into the book the kinds of allusions I expected Tim Powers to be putting there. I found little of interest in the tale as told, at least after the action moves to purgatory. The setting and events there all feel too perfunctory, there is insufficient reason to invest in the protagonist and little likelihood of discovering something profound about the nature of existing. Still, as a jumping off point for rummaging around my own knowledge of the Western Canon, I did get a good deal out of the book. It ends with a small kind of redemption for Holbrook. This minor key resolution to the story gives him new purpose, and a feeling that history has repeated itself and will continue to repeat for as long as there are people. Duncan Lawie has been reviewing SF for half as long as he has been reading it, although there was a quiet period during two years as an Arthur C. Clarke Award judge. His reviews also appears in the British Science Fiction Association's Vector Magazine .